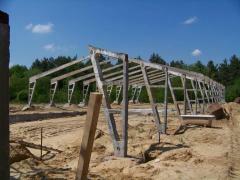 Construction of the proizvodsvenny room, warehouse and trade pavilyon 15*48*5. Wall-sided, dual-slop, warmed, without gruzopodyomny mechanisms. Construction of rooms of selskhozyaystvenny assignment pigsties,cowsheds,hen houses, potato storages,ovochekhranilishch,granaries, etc. ),"on a turn-key basis".0502003248. Specify the price and conditions by phone. Construction of selkokhozyaystvenny rooms (pigsties, cowsheds, calf houses, hen houses) from easy metal designs of any sizes behind desire of the customer. 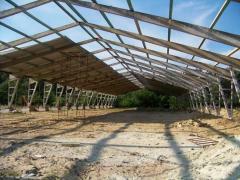 Unbelievable price on Agricultural buildings in Kalush (Ukraine) company StalBudMontazh, OOO. Wide choice of quality products at affordable prices.